Ni Hao in Mandarin Chinese means hello. I’ve known this ever since I started working for a Taiwanese company many years ago. However, in all my language obsessed mothering years, I’ve never even attempted to teach my children any Chinese, not even as a dinner party joke (look at my cute children, they can dance and say “hello” in Chinese!). But, one day, my eldest daughter (4) looked at me with that mischievous face she has when she’s doing something clever or a bit naughty, and smiling said to me “Ni Hao”. At first, me being me, thought, at my age, my hearing was failing me, and she probably was saying something different that sounded like “hello” in Chinese. A few days later, being an iPad type-work-at-home mum, I was working ferociously at my computer, when I thought that I should just go and checked the iPad hadn’t being drowned in water or covered on dinner like our very old computer (which survived, by the way, strong old Macs!). And then was when I discovered both girls watching (they open the Netflix app themselves) Ni Hao, Kai Lan! So, no, it hadn’t been fluke, she had actually said Ni Hao to me, knowing full well or imagining that I wouldn’t have a clue what she was saying. There was when I discovered, that actually, yes, cartoons can teach some language. Even if it´s just a few random, selected words. It was then when I indulged in my secret hobby of watching children’s cartoons, all for research, of course! 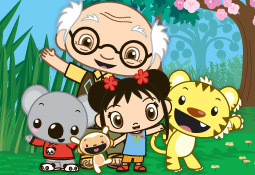 Kai-Lan is a little American-Chinese girl who interacts with his friends and family in this funny series. They speak American English, and like in Dora the Explorer, they drop in some Chinese words and phrases. The result is an entertaining series with educational value. There is so much great information and support on this site! Thanks for pulling the community together. I wanted to share another great resource http://kiddokorner.com/Foreign-Language/ there are over 20 different language block sets. Perfect for introducing or teaching another language to a toddler.